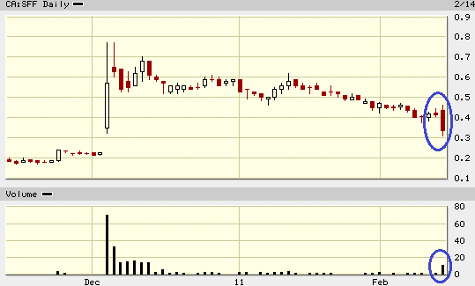 Yesterday, the stock of Seafield Resources Ltd. (CVE:SFF), (PINK:SRLTF) went sharply down on two markets. Probably, many people were disappointed with the information contained in the company announcement from the same day. This might have been the reason for the shares' plunge. In a day prevailed by the sellers, the stock lost over 19% on the TSX Venture Exchange (CVE) and almost 25% on the American OTC market. On the CVE, the fall was additionally confirmed by the heavy trading volume of 10.84M shares. This exceeds six times the average turnover for the company. On Monday, Seafield published the assay results from the last nine holes of the recent drilling program on the Miraflores property at its Columbian Quinchia gold project. Maybe, investors were dissatisfied with the announced golden grades and, consequently, the price of the shares dropped. After the gains in early December that led the stock to a year-high of $0.77, SFF is on the fall again. It has lost 45% over the last two months. Company's fundamentals additionally increase the negative sentiment around Seafield Resources. The company has no revenues, and declared a net-loss of 1.39M for the first nine months of 2010. Until Sep. 30, 2010, Seafiled had spent more than $2M only for exploration activities on its mineral properties. However, the company has no reasons to panic. There are also several positive factors that could reverse favourably the move of the shares. Seafield took measures to solve its liquidity problems. Just before Christmas it completed a $15M private placement. Besides, at Sep. 30, 2010 the company had working capital of $3.11M, or 33% more than at the end of 2009. In light of all mentioned, it is hard to predict the future performance of the stock on the market. It is worth noting that Seafield owns thousands of hectares in Columbia - a country, where the mining industry is rapidly expanding and has a great potential, as some online reports also prove.